I never planned to be a coffee drinker. When I was little it was a "treat" to get to refill my mom's coffee cup, mostly because it meant that I could taste the dregs in the bottom of her cup. It didn't really matter that I thought it didn't taste like is smelled, or that it was one of the nastiest things I'd ever tasted. 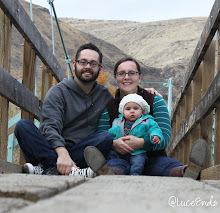 What mattered was that it somehow made us (Kyle and Kelly too!) feel grown-up to actually know what it tasted like. My mom, Grandma, and Grandmother all drank coffee every morning. Once a little older I just didn't think it tasted good enough to want it every morning... or at all for that matter! You may wonder what was wrong with me, after all I did grow up in Seattle. Hello?! Starbucks' hometown! Well, don't worry. My best friend in college, Ann, bought me coffee our first day of classes, and set me on track for a proper coffee filled outlook on life. We had arrived early to make sure we were on top of things, after all, college students have it all together. Sort of. Not really. We wandered up to the coffee cart and she ordered some sort of grasshopper drink, and asked what I wanted. I didn't know what any of the drinks were. I didn't know the difference between a latte and a mocha, but I had heard people order white chocolate mochas, so that's just what I did! It was actually pretty tasty! Over the next year Ann and I had coffee together several times a week, both at school and at Starbucks. I even graduated from the super sweet hide-the-coffee-flavor white chocolate mocha to a plain old mocha! By Christmas I was even ready to branch out and try an egg nog mocha. The summer after my second year of college I worked in a little coffee shop (my favorite job to date) at church for my friend Judi. That was somewhat educational because I learned terminology, was able to taste whatever I wanted, learned how to make great shots, and got do do a little experimenting. Let's just say that pumpkin lattes should not have canned pumpkin mixed in. About the same time I met and started spending a lot of time with Rebecca, who worked at Starbucks for a few years. 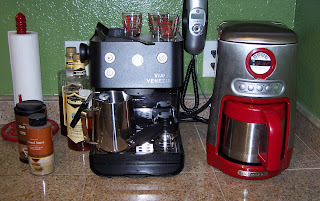 She helped further my coffee education, and gave us a coffee maker for our wedding. Then came the desk job. I had a job that didn't use very much brain power the first year we were married, and the obvious solution was to add something exciting the day, right? I didn't want to spend money on coffee every day, but there was always a carafe of fresh black coffee out for staff. I started drinking plain old coffee every few days with coffee mate. From there, my love of coffee just kept progressing. Tom got me an espresso machine for my birthday last year, which means I now have a coffee counter... plus 2 grinders that don't fit on the counter. Tom loves iced caramel drinks, and I'm willing to try most drinks as long as they don't have soy or almond flavor. So all of your fears should now be relieved. I live in Seattle and drink coffee most mornings. 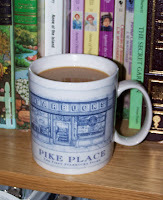 Oh and I have been to the Pike Place Starbucks, the original retail store that opened in 1971. I now have a favorite roast, which sadly Starbucks only caries a few months a year... yes, it's the Christmas Blend. This winter I got discounted Starbucks cards at Costco, then used those to purchase 8 pounds of Christmas Blend in December. I should be set for beans until September when the Anniversary Blend comes out, which is the next closest flavor to Christmas Blend. I still try not to have more than one cup a day because to much caffeine makes me feel awful. I know there are studies that go both ways... drink more and drink less. I just saw a news clip today suggesting that if women drink 4 cups or more a day, they're 20% less at risk of having a stroke. I've also seen recent reports that say caffeine increases the chance of birth defects and miscarriage significantly. I guess the big thing is not be be mastered my it. Moderation. Enjoy your coffee, or stop by and share some of mine anytime! Why did I waste my time on that?